Kitchen | Oh, The Glamourous Life! Happy Friday! It sure is cold out there! I mean, Boston is nowhere near as bad as the Midwest, but it’s still No Fun At All. Here’s a tip to help you get through the day. Your mother was right! Don’t skip breakfast, especially when you’ve got a busy schedule. My favorite breakfast food is delicious, filling, good hot or good, has room for creativity, and is super easy to make — overnight oats. At its simplest, overnight oats are just equal parts old-fashioned rolled oats and liquid. Don’t use instant oats because you’ll end up with mush. Don’t use steel-cut oats because they won’t soften enough. For the liquid you can can use milk (of any sort), fruit juice, or just plain water. 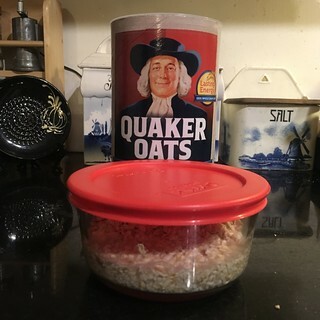 Put your oats and liquid in a container with whatever toppings and seasonings you like, cover, and stash in the fridge overnight. In the morning, eat. It’s that simple. In the evening, I pour a half cup of oats and a half cup of liquid in a Pyrex container (as seen to the right), then add my toppings. I pop the lid on, stick it in the fridge, and ignore it until morning. I prefer my oats warm, so I microwave them for a minute or so (hence the glass container). But you can grab them right out of fridge and dig in. Topping the oats is where thing get fun. You can add fresh or dried fruit, nuts, seeds, spices, fresh greens or herbs. I know oatmeal often has sweet toppings, but give savory oats a try. Use apple cider for the liquid and add chopped apples, toasted walnuts, and dried cranberries. Sprinkle with a little cinnamon. 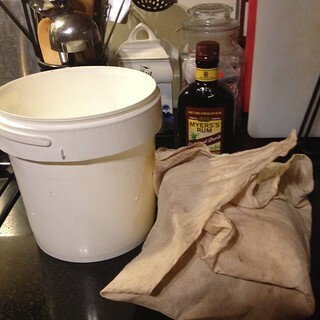 Make the oats with water and add a splash of soy sauce and a dash of sesame oil. Top with sesame seeds and chopped scallions. This one is basically dessert. 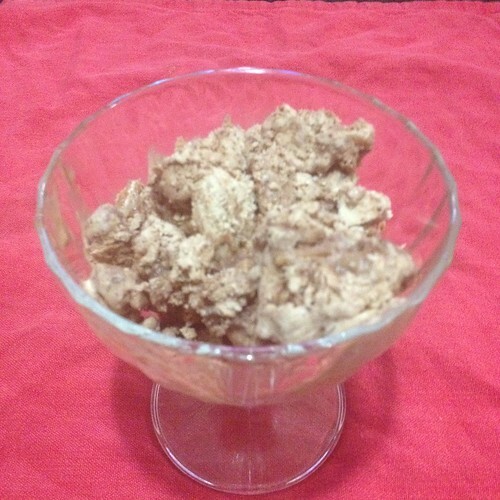 Make the oats with milk. For true decadence, use chocolate almond milk (personally I think it’s a bit much). 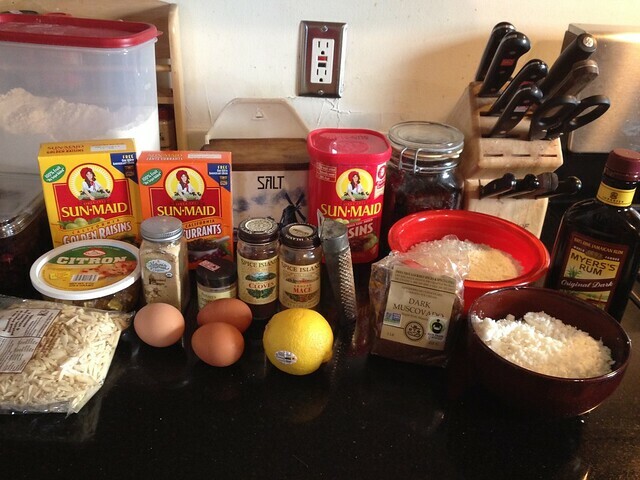 Top with toasted shredded coconut, toasted slivered almonds, and a few dark chocolate chips. If you warm this one, the chips get all melty and ooze through each bite. I’d like to share this old* family recipe with you. Ailes de poulet a la diable is French for “deviled chicken wings”, basically chicken baked with a delicious coating of mustard and breadcrumbs. 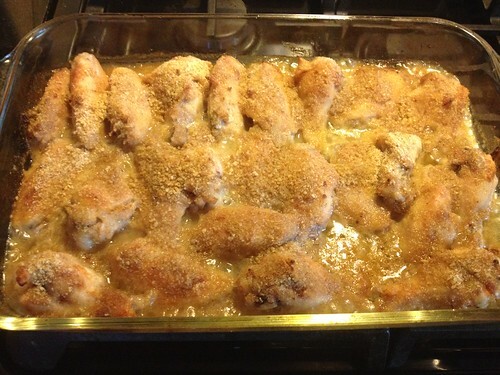 You’ll need chicken wings, bread crumbs, chicken broth, Dijon mustard, Worcestershire sauce, salt & pepper, butter. I’ve made this with both whole wings and the cut-up sort. If they’re whole, tuck the wing tip behind the other wing end, to make sort of a heart shape. It’s tidier and you can fit more in your baking pan, if you alternate which end is up. I actually prefer the whole wings, but the cut up ones are less messy. Fresh bread crumbs are great for this, but I often use the kind that come in the canister. I’ve never tried it with panko. Let me know how it is, if you do! 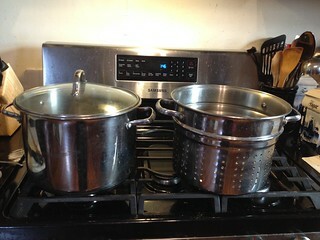 I’ve used home-made chicken broth, canned chicken broth, and even mix-it-with-hot-water bouillon. I really like Penzy’s Chicken Soup Base for the latter. It’s not as salty as the little cubes and has much more flavor. Grey Pupon used to be my favorite Dijon, but I discovered it has added sugar, so now I use Maille. Preheat the oven. Salt & pepper the wings while melting the butter in your baking dish. I just put the butter in the baking dish, pop it on a stove burner, and let the butter melt. Roll the wings around in the butter before cramming them into the baking pan skin side down. Blend together some chicken broth, mustard, and Worcestershire sauce. I just mix them all in the measuring cup and pour over the wings. Sprinkle with half the bread crumbs. Turn the wings and bake another 15 minutes. Turn the wings again and bake another 15 minutes. Add the last of the chicken broth and sprinkle with the remaining bread crumbs and bake for 10 minutes more. Have lots of napkins ready. I suppose there might be a neat and elegant way to eat these wings, but I’ve never found one (and you know if I can’t eat it elegantly, it just can’t be done). Season chicken with salt & pepper. Melt butter in a large baking dish. Add wings and turn to coat. Place wings skin side down and bake 15 minutes. Blend mustard and Worcestershire sauce with 1/3 cup chicken broth. Pour over chicken and sprinkle with 1/3 cup bread crumbs. Turn wings. Bake 15 minutes. Turn wings again. Bake 15 minutes. Add remaining chicken broth. Sprinkle with remaining bread crumbs. Bake 10 minutes. *and by “old”, I mean I’m the second generation to cook it. My family does not have a long-standing culinary tradition. Tomorrow is Mardi Gras! And Shrove Tuesday! And Maslenitsa*! At The Manor that means pancakes. Actually it means blini. 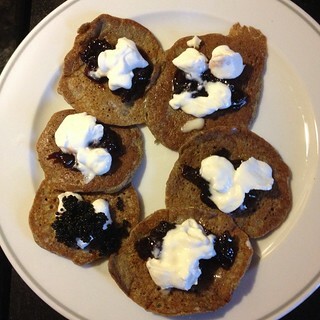 Blini are Slavic yeast-raised buckwheat pancakes that are fairly involved to make. Usually we made quick blini, which are easy and good, but don’t have the flavor you only get with a yeast batter. Then I found Ruth Reichl’s recipe, which is much simpler than traditional blini and still so delicious. 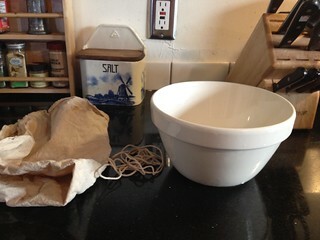 Mix together flours, sugar, salt, and yeast. The sugar is just there to give the yeast something to eat. These pancakes aren’t going to be very sweet. Melt the butter into the milk in a small saucepan. Cool until it’s just warm. If you put a drop of milk on the inside of your wrist and it doesn’t feel hot, it’s about the right temperature for the yeast. Whisk the milk mixture into the dry ingredients. 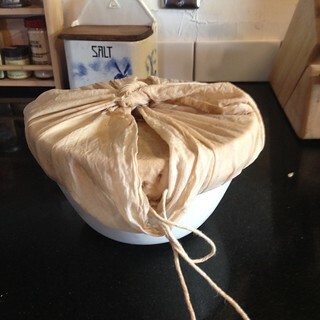 Cover the bowl — plastic wrap is fine — and put it someplace warm to rise until doubled. My fancy new oven has a bread proof setting, but I used to set the bowl next to one of our cast-iron radiators. Rising will probably take about an hour and a half. Once it’s doubled, whisk in the eggs. Now stash the batter in the fridge until the next day (that’s why I’m giving you the recipe today instead of tomorrow). You could make your blini right away, but they’re better if the batter rests overnight. Stir the batter well before using and let it sit at room temperature just a bit to get the chill off. To cook, generously butter a frying pan or griddle. Really be generous with the butter. Maslenitsa means “Butter Week”. Pour out some batter into the hot pan. You can make huge blini the size of the pan or little bitty ones. Totally up to you, but they should be thin. The blini only need to cook for about a minute on a side. The first couple are going to be terrible looking, so eat them right away before anyone can see the evidence. As the blini come out of the pan, put them into a low oven (about 200F) to stay warm. Serve with melted butter, sour cream, jam, and/or caviar. If your blini are thin enough, you can roll them around the fillings for an elegant presentation. I usually don’t bother. I served the ones in the photo with sour cream and homemade sour cherry jam. *which actually starts today, but it lasts a week. Last month we celebrated both Scratch’s & Devora’s birthdays and I made zuppa inglese for our little party. What?, you may ask. True Italian zuppa inglese (“English soup”) is sponge cake soaked in alkermes and layered with pastry cream. There’s great debate as to the age and origins of the dish. One theory is that it’s an Italian take on English trifle, hence the name. 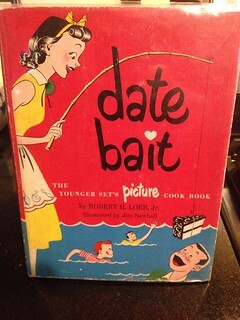 As much as I want to, I’m not going to take you down a rabbit hole of culinary history. Not now, any way. Alkermes (also spelled “alchermes”), since I know you’re going to ask, is a liqueur flavored with spices and colored a gorgeous red with dried cochineal insects (also known as kermes, hence the name of the liqueur). Do not be repulsed by the inclusion of bugs. They’re totally harmless and frequently used to color food and cosmetics as “carmine”. 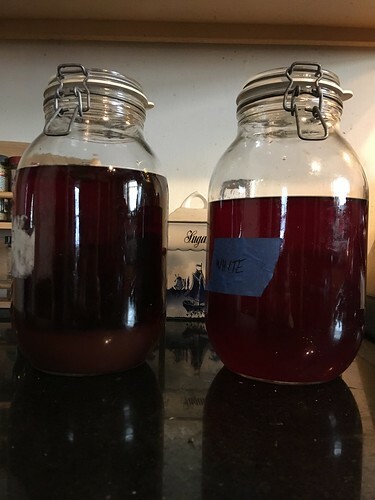 I’ve made alkermes and it’s such a beautiful color. That, however, is a story for another time. 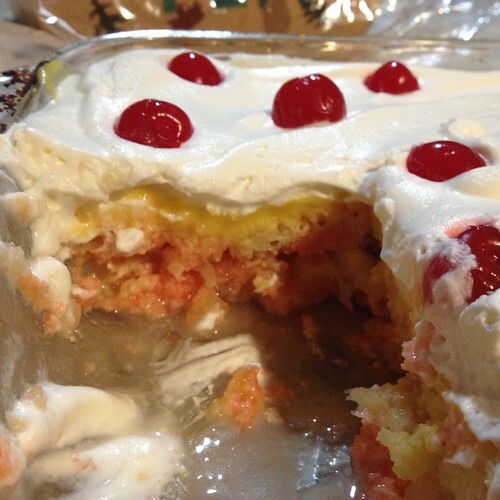 Now, the zuppa inglese I made is not the authentic Italian version, but more of an American adaptation. I got the recipe from Angie Pontani via her Go-Go-Robics II DVD (yes, she provides recipes on a exercise video). This zuppa inglese is the style of dessert known as “icebox cake”, since, after layering cake or cookies, pudding or whipped cream, and perhaps fruit, you chill it in your fancy new-fangled icebox. During the 1920s it was also known as “flapper pudding” because it was so quick and easy even a flighty modern gal could throw it together. Icebox cakes of many different styles have been popular throughout the 20th century. You might remember one made of chocolate wafer cookies layered with whipped cream. 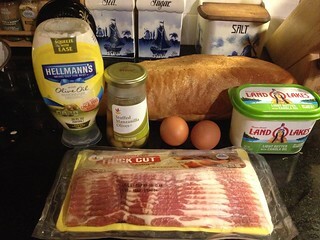 For this recipe start with sponge cake or lady fingers. Some say you can use pound cake, but I think it’s too heavy. If you don’t have time to make cake, you can certainly buy it. I baked a sponge cake of the sort the Brits call a “fatless sponge”. 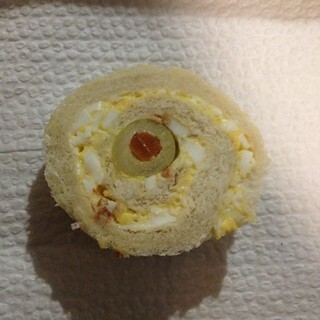 It has no butter and is lightened with well-beaten eggs. 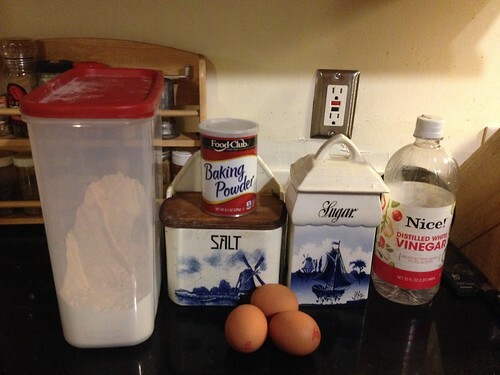 You’ll need flour, sugar, baking powder, salt, hot water, vinegar, and eggs. Separate the eggs. Sift together flour, baking powder, and salt. Beat the egg whites until stiff. Beat the yolks until thick and lemon-colored. Gradually beat in sugar. Add flour mixture, hot water, and vinegar to egg yolks. Fold in egg whites. Bake in a greased and floured pan and let cool completely. You can make this a day ahead. 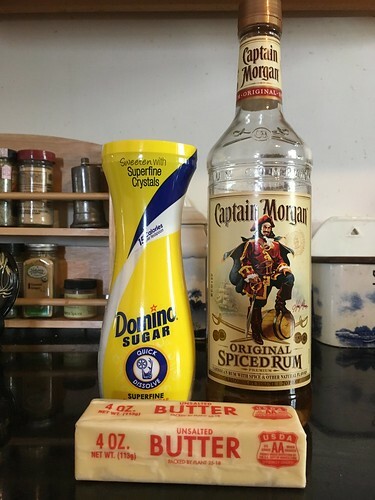 When you’re ready to make your zuppa inglese, you’ll need the cake, a big can of crushed pineapple, a jar of maraschino cherries, amaretto, a box of French vanilla pudding, milk, heavy cream, sugar, and vanilla extract. 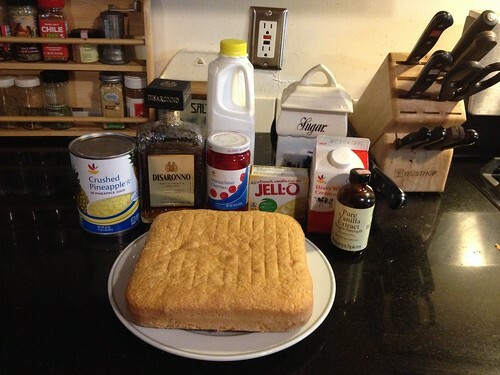 Cut the sponge cake into 1/2″ thick slices. Drain pineapple and reserve the juice. Drain maraschino cherries and reserve the juice. 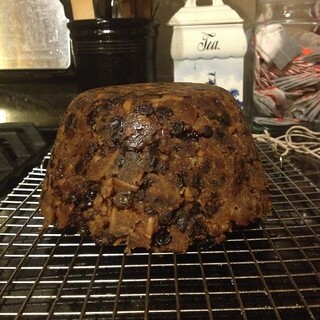 Make the pudding, but use one cup less milk, so it’s thick & spreadable, and chill it. 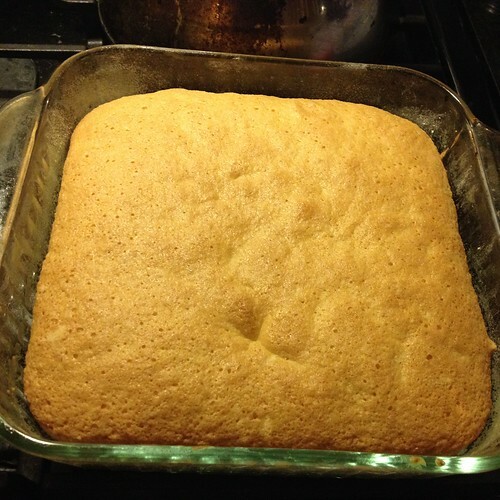 Lay half of the sponge cake slices side by side in a large dish. 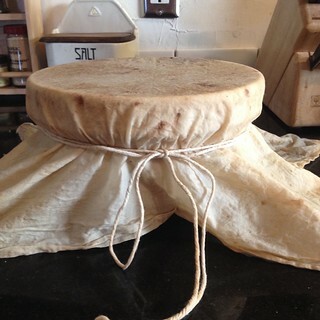 I was transporting this to rehearsal, so I used a 13″x9″ baking dish, which was perfect. Drizzle half the pineapple juice over the cake. Do the same for the cherry juice. Then repeat with some amaretto (or rum). Spread the pineapple over the cake. Get it right to the edge! Cover the pineapple with another layer of cake slices. Sprinkle with the remaining pineapple juice, cherry juice, and amaretto. Spread the pudding on top of the cake. 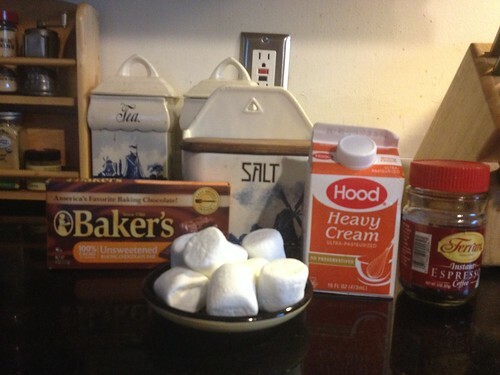 Make whipped cream with heavy cream, sugar, and vanilla. Spread over the top of the cake. 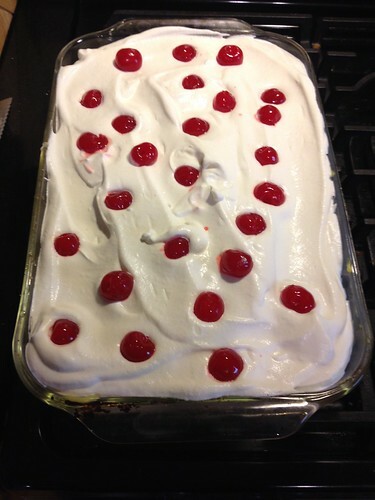 Decorate with the cherries and chill for a couple of hours in the fridge. You can sort of see the layers and attractive colors here. You want to serve this the same day you make it or the cake gets very soggy. It’s still delicious, just wet and easier to scoop than slice. 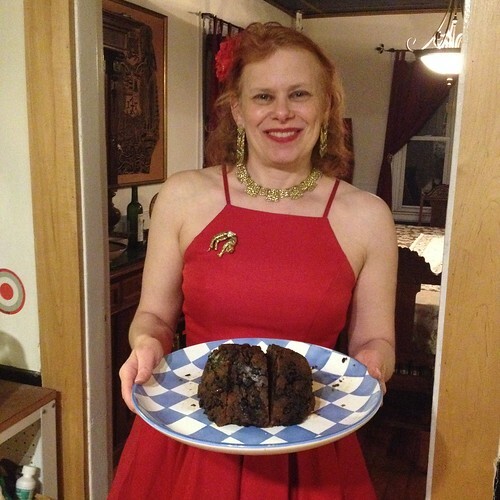 If you want the actual recipe, you’ll need to get a copy of Go-Go-Robics II or perhaps Angie will post it on her new blog.